Just the other day I was walking down 42nd St, near Grand Central Station, when suddenly the tornado of a sweet craving hit me. As I walked on, my eyes were alert to sweet possibilities. Ice cream, pastries, croissants, muffins, anything with sugar would do. Soon I hit pay dirt in the form of Baked by Melissa. Baked by Melissa on E 42nd St near Grand Central station, is a tiny store that serves tiny cup cakes for cheap prices. The staff were friendly and I quickly purchased six tiny cup-cakes for $5.50. 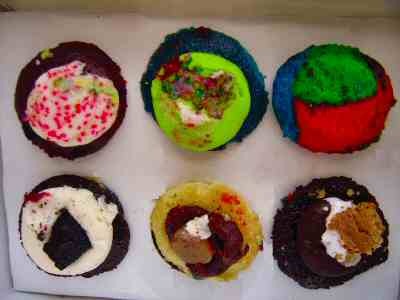 If you ask me, of the six cup cakes I like the Tie-Dye (see picture below, Top Row at Far Right) best of all.